The diagram below shows how Library Manager enables the attachment of the DSI Virtual Tape Library (VTL) and DSI Physical Tape Library (PTL) to OS 2200 systems, in an environment with other tape devices. Library Manager and its support of DSI VTLs and DSI PTLs may coexist with manual tape drives and/or with Oracle/STK cartridge tape libraries (CTLs). The oblique orange lines show the data path. For I/O, the VTL is connected to the 2200 system via Fibre Channels. The horizontal green lines indicate the control path. This is the communications path used byLibrary Manager to issue mount and dismount commands to their libraries. Library Manager is closely integrated with STAR-1100. The Library Manager uses ComAPI to communicate with the VTL and with the STAR Scratch Pool Selector Service. Can be configured for your OS 2200 to be connected to multiple VTL libraries. Can be configured for multiple OS 2200 systems to connect to a single VTL library. Supports one physical tape library (PTL) connecting to one OS 2200 system. Has a set of commands you enter from the system console to control operations. Integrates with scratch pools managed by STAR-1100 and provides for a default pool. 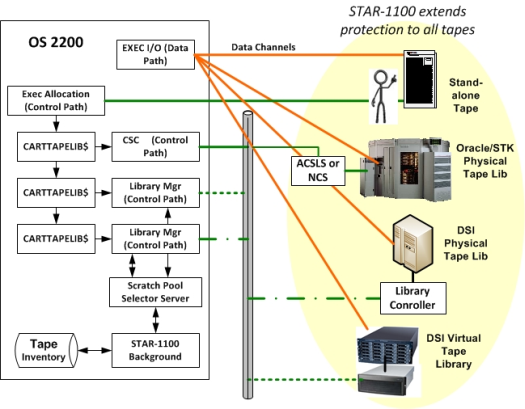 Maintains communications with the VTL and/or PTL to sychronize tape statuses with STAR-1100. For most sites Library Manager is ready to INSTALL directly from the release media. Optionally, it can be generated through COMUS for implementing corrections or alternative configurations. Support for Library Manager is provided as a coordinated response between Unisys Corporation (Unisys) and Formula Consultants Incorporated (FCI). Submit your Level 1 Contact through Unisys. FCI provides Level 2 support for Library Manager 24 hours a day, 7 days a week. Unisys will escalate all appropriate issues to us and FCI will respond promptly. Support services are provided 24 hours a day, 7 days a week. For more information, call (714) 778-0123 or send us a Web Mail message.